There are just some foods you leave to the pros, and when I heard about a creperie opening in west village, my only thought was, will it stack up to the one I had in Paris? It’s a legitimate question, and I quickly got my answer: incredible crepes can be found anywhere. I just happened to find one of the best creperies right off Sixth Ave. Welcome to Jean Le Gourmand. Just a few steps down from the movie theater, past the shops, sits Jean Le Gourmand. The restaurant is in casual counter service style with bar seating along a zig-zagged wall. A simple, cute menu with savory and sweet crepes donned the walls, but all my guest and I could focus on at first were the custom-made crepe machines anchored in the middle of the establishment. Staff were pouring, flipping and serving perfect crepes from the machine every 20 seconds or so, which signaled to me that these people were not messing around. It was time to get serious. The menu hits all the price points — you can get a simple crepe with sugar for $2 or get something a little fancier for $9. My guest and I opted for the nutella strawberry crepe ($6), the spinach, mushroom and cheese crepe ($7) and the chicken bacon ranch crepe ($9), which was a special. We waited no more than a few moments, and the crepes were ready for us. We grabbed lots of napkins. The nutella strawberry crepe was the perfect combination of tart and sweet, fruity and chocolatey, while the crepe itself was bouncy and pillowy. The spinach, mushroom and cheese crepe was creamy, mild and comforting while the chicken bacon ranch crepe was juicy with ripened avocado and melty cheese. 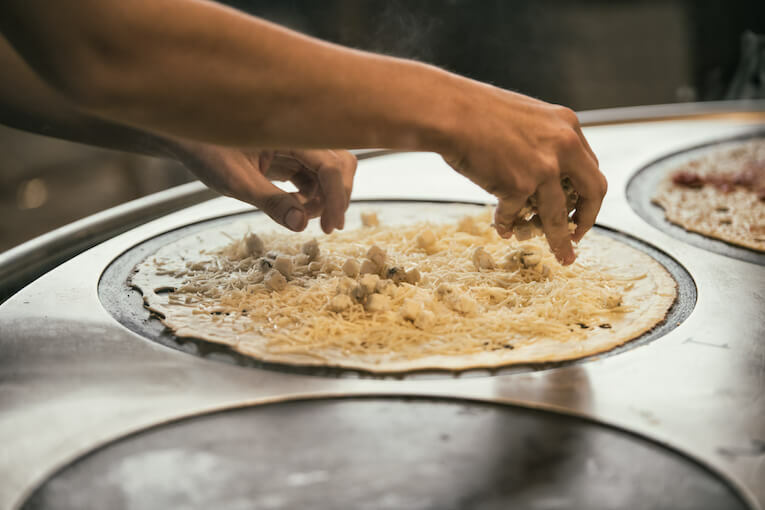 We agreed that it would be the perfect quick lunch given how quickly the crepe was made — and we bet this place is poppin’ around noon every day for that reason. There are a variety of bottled drinks and fresh iced tea on offer for $3, and while we stuck to our own water bottles, we were tempted by the tea. 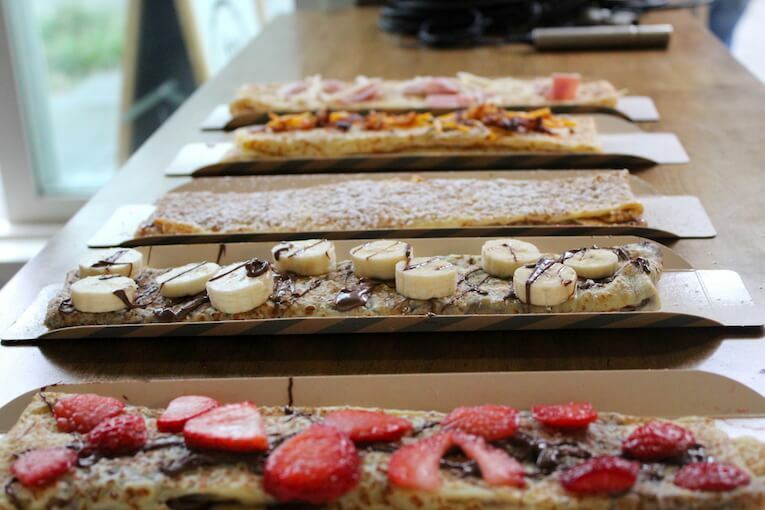 If it were anything like the crepes, we’d likely have died and gone to heaven. So, is it Paris-level good? The answer is yes, and it’s no surprise why. The Blachère Group, who operates the Marie Blachère bakery from France, is the mastermind behind Jean Le Gourmand. Basically, of course it’s as good as a French crepe, because it is. 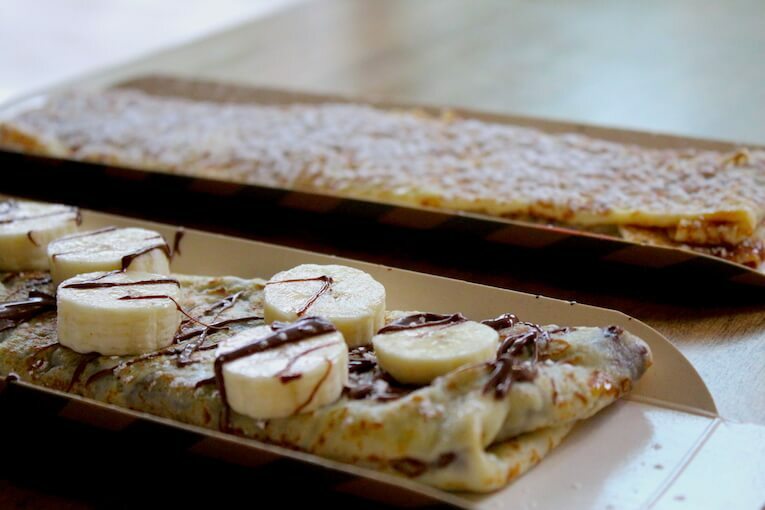 We New Yorkers now have two things to thank the French for — the Statue of Liberty, of course, and these crepes.